I can't believe it. 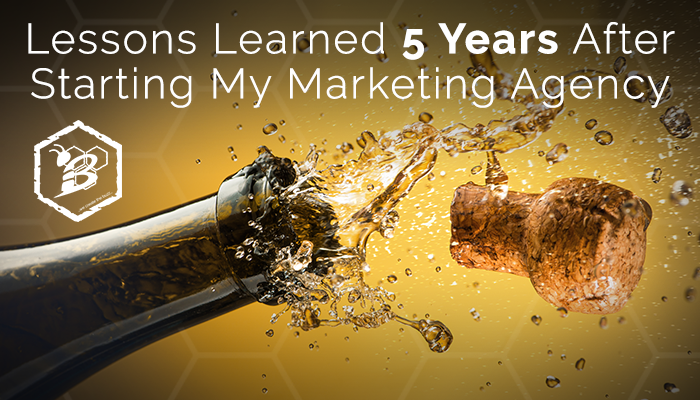 As of today it has been five years since I started my marketing agency. FIVE YEARS! How did that happen? It's been one heck of a ride full of ups and downs, great clients and not-so-great ones, and plenty of fantastic decisions along with some shaky ones. As with any business, it's not all sunshine and rainbows, but I wouldn't trade my experiences over the last five years for anything. I always knew I'd start a business. It was a goal of mine from a very young age. I remember day dreaming as a child about running my own business. I was always a leader and wanted to do what everyone else said was impossible. After eight years as a Marketing Manager, Assistant General Manager, and General Manager for a few different businesses including Splitz, FatCats, and even a nightclub; I was ready for a new challenge. In the early years of my career I worked for and learned from some of the smartest people I've ever met - shout out to Steve Thompson, Dave Ritter, Sean Collins, Curtis Dye, Courtney Lauti, and Deanna Hanks - all of whom continuously pushed me to be my best. Once the opportunity to start my business presented itself, I just couldn't say no. See, I think I'm addicted to change. I love to constantly be challenged, to learn new things, and to submerse myself in new industries. What better fit than a marketing agency? So I started my first company, Bee Social. Yeah, we used to have a different name and a different focus. Started as a strictly social media marketing agency, our goal was to work with small businesses on their social media marketing and advertising. The problem was that after about six months we realized that if we were really going to move the needle and actually help our clients grow, we couldn't only focus on social media. We had clients starting to ask for more - websites, SEO, graphic design, content marketing, and more. One of the biggest lessons that I had to learn right away in my business was to be flexible. It's not easy to admit that your initial thoughts weren't right or that they needed to be tweaked. It was a very valuable lesson for me though and I'm glad it happened so early. My agency has been through countless changes over these five years and that one may have been the biggest. It's when we "grew up" and became a full service agency instead of just a social media shop. When you are so passionate about something, it can be hard or even impossible to think that others don't care as much or even at all about it. The reality, though, is that no one will care about your business as much as you do. I've poured my heart and soul into HIVE over the last five years and had to learn that no one - not clients, not vendors, not employees, and not even partners care as much as I do about HIVE. I also learned that it's ok that they don't. See, I'm building my dream, but that doesn't mean that it's theirs. I'm willing to work 18 hour days, 100 hour weeks, and I never stop thinking about my clients, growing the business, and the next steps towards reaching HIVE's goals. I can't expect that kind of commitment from anyone else though. Even past business partners that I've had just weren't as passionate about it as I am. No one cares as much as I do - and they shouldn't. This is my baby. When you're starting out, you wear all the hats. It's just how it goes. I had quite the collection of hats. When Bee Social started, I was everything. I was the salesman, the designer, the strategist, the copywriter, the developer, the accountant, the CEO, the secretary, the account manager, the social media manager, and even the janitor. As we've grown, I've found the things in the business that I love and the things that I hate. Yes, there are things in my business that I hate. I hate accounting. I hate trying to keep up with social media - I know, ironic considering our start. And most of all, I hate sales. So what I've found is that in order for us to be successful, I need to do the things that I'm best at and love doing while delegating the rest. I've hired an amazing team that I'm so grateful for. I hired a CPA to handle my accounting. I hired a Business Development Manager to handle sales. I've hired a Social Media Manager to keep up with client posting, trends, and research. I've hired account managers that are becoming the faces of HIVE. I've hired copywriters, designers, and developers that have helped elevate our clients' content. I've hired in a lot of different areas and hired for specific duties and skills. I believe, now more than ever, that the key to running a successful agency (or any kind of business) is putting the right people in the right seats. It can be tempting to just put more on current employees' plates or to do it yourself, but the quality will suffer and the time spent on the new tasks will be dramatically higher. My lesson was to hire for specific skills, especially skills that I don't have. When you're starting out, you'll take any client that is willing to write a check. I know I sure did. If you had a business and wanted to pay me, you were in and I was excited to have you. The problem is, that just simply isn't scalable. As we grew, we learned that we had to be more selective. Not everyone is a good fit for us. This might have been one of the hardest lessons that I've had to learn, but it was also the most liberating. Turning away money is never easy, but it can be necessary. We turn business away fairly frequently. It can be because a client can't afford our services. It can be because we don't have the same philosophy as the client. It can be because we don't think we're the right partner for them. It can be due to bandwidth. And it can definitely be because of a lack of respect. Towards the end of our first year in business we had just signed our largest client to date - by far. Looking back now, it wasn't that huge of a client, but at the time it was a gigantic step for us. We were beyond excited to have them and I started dreaming about where my business was headed. In the first meeting after we kicked off work for this client, I quickly learned that there are people that I can't work with. He was rude, overpowering, disrespectful, and combative. He insulted me and my team. He raised his voice and tried to bully us. Before that first meeting ended, I fired him. It was heart wrenching. I had just fired our biggest client less than a month after signing them. What a let down. In hindsight, it was one of the best decisions I have made for the business, for my team, and for myself. It was liberating. I didn't need him. I didn't start my business to deal with awful people. I started my business to help other businesses grow. When we hung up that call, I remember my team looking at me and thanking me for standing up for them. They didn't care that we had just essentially lit thousands of dollars on fire, they cared that I fought for them and they knew that I wasn't going to let anyone treat them like that. I learned early in my career that, "the customer is always right," is actually a lie. Your employees come first. When you stand up for them, fight for them, and treat them right, they'll go to battle for you. We've had other clients come in and leave quickly because they weren't good fits. It's fine. It's better than fine - it's great. We have learned to be selective and have learned to focus on and search out the companies that align with our values and goals. It really has changed how we view our client relationships and has made us more successful and so much happier. It has been one heck of a ride. I've learned, I've grown, I've made too many mistakes to count, but at the end of our fourth year, I couldn't be happier. We've accomplished so much and I couldn't be more proud. Proud of what we've built, of the work that we do, and of my team. Here's to the next five years. I can't wait to see what lessons are in store for us.